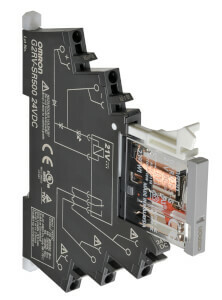 Omron recently introduced G2RV-SR, a new 6mm electromechanical relay, replacing a highly popular standard unit. But this was no simple upgrade, the new G2RV-SR has been developed for the Panel Solution offer as the core of the Value Design Products and Omron, has packed the new slim relay with an impressive array of time-saving features. For example, the new relay has Push-In Plus technology, which reduces wiring time by more than half; it has a dedicated test button for faster, easier diagnostics; it has transparent housing and a mechanical indicator for faster checking of the contact state; and it has a strong mechanical pin with a larger contact surface for better conductivity. And that’s just the start, the new G2RV–SR has many more new time-saving features. But why has Omron built all this innovation into what essentially is a basic component? Among the most impressive time saving features is the new top and bottom mounting levers. To mount the G2RV-SR you can keep both levers closed, but to dismount it easily you now only need to open one lever – effectively reducing mounting time by a factor of two. This feature also means that the relay can be mounted upside down for multiple options. All movable parts are now colored white and are easier to see in the dark, this makes assembly faster, helps avoids mistakes and reduces maintenance. Omron’s own Push-In Plus technology also features in the new relay. This not only reduces wiring time by 60%, it also improves reliability thanks to a much stronger connection than screw type terminals, which has more resistance to vibration. The new G2RV-SR is much smaller than the previous model and so it free-up space in the panel for additional functionality. A special latching lever reduces time spent on circuit time, operation confirmation and inspection work. The protective cover also prevents incorrect operation. All your wiring codes are now clearly visible from the front of the relay, making maintenance faster. 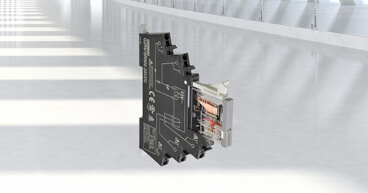 A choice of one frontal PLC interfaces (8 or 16 channels) or a I/O Relay Terminal with Push-in Plus technology (16 channels) further reduces connection time. Anyone who is familiar with Omron products and services will not be surprised by all this attention to a relay. Although these units are often viewed as rather basic elements, their role is crucial to the trouble-free running of a plant. Omron has been designing and manufacturing relays for well over 50 years and has grown to become the world’s largest single-brand relay manufacturer. The outstanding performance of these relays is the result of careful design considerations and a complete commitment to quality. Today globally, Omron sells 25 relays every second, 24/7. That’s 800 million per year. So not surprisingly, it is well within the company’s core business interests to ensure it continues to offer the best possible relay solutions. And by doing so, it is helping to create more profit for panels builders across the globe.